If you’re still used to the old traditional way of disciplining a dog, then that means you’re not catching up with technology. As a dog trainer, you should care much about what’s safe and reliable for your doggie, putting into consideration that the communication between an animal and human is hard, that will leave you with no other option. What the collar does is it releases static ( some use vibration or tapping ) energy when you press a particular button, but it won’t do any harm to your dog. The dog will get the message instead, and it’s much faster and easier for it to get the command and correct its mistakes. It’s also much safer than the trad way because you won’t lose the friendship, you would remain as close as you were. Pet trainer is a brand that came to this industry a couple of yrs back, and it also managed to make quite some sales which mean it satisfied quite a lot of buyers. It has over 5000 Amazon reviews, and Amazon qualified customers apparently made these reviews. All those reviews left a reasonable rating of 3.8 stars on Amazon. Pet trainer also has a staggering guarantee of 5 yrs, now that’s not a joke. Their services are super supportive, and if you have any problems, you simply call their customer service number. This is so important when buying something online because if you feel like you don’t like anything about their product you simply shoot an email or give them a call, they will quickly respond and give the best service. This collar has a reasonable price, so checking it out at Amazon would be worth your time. The other thing that made us feature this product on PetLoverGuy is the balance between the price and its features. It comes fitted with quite many stimulants, namely vibration, sound, and static stimulants. I don’t need to explain how these work because I’ve already done so here. Another feature that’s awesome is, it is water resistant. Best water resistant collars are quit hard to find especially at such a low price. Mostly pet trainer collars are black, that’s the most popular color for this brand so far. This collar can fit all sizes of dogs, either your dog is small, medium or large. This is made possible by the belt that’s designed to be universal, and you simple adjust the belt to the perfect position that fits your dog’s neck. This is also made possible by the lightweight of the collar, and even a small dog can wear it. If your pocket isn’t deep enough, that would mean folding this Petrainer won’t be a problem. PetTech also managed to make quite a large no of sales on Amazon. These Amazon qualified customers left a rating of 4.3, that’s definitely something you won’t regret. This collar is also priced reasonably but you’d have to fork out a few more bucks because the price is a bit more than that of Petrainer. PetTech provides lifetime guarantee, and that’s awesome. If You Ever Have any Issue with Your Training Collar, the Manufacturer will Provide a full Replacement or Refund. This collar fits all dogs, and that means it’s universal. Another awesome feature that’s provided by Pettech it that, the lithium ion battery can last for long hours, considering that it has a power saving mode. If you regularly train your dog that is a feature you shouldn’t miss. This collar is waterproof, and that means you can train your dog even on a rainy day. That will increase consistency for serious dog trainer’s from rainy countries or simply for rainy seasons. This dog collar can be used by almost anyone willing to train a dog, be it experts or newbies. Another awesome thing is Pettech is providing one on one coaching for your dog thru email, the person giving instructions won’t be some random person, you’d get instructions from real experts. The remote transmitter of the collar can reach up to 1200 foot, that’s fit for training it in a park. This dog training collar basically has three types of stimulants namely light, beep, vibration and static shock. Its LCD is huge, and it has a nice blue backlight to assist you at night. The remote transmitter is so portable in a way that it fits your pocket without forcing it. It has a premium covering (it’s not a sugar coating, it’s real) that definitely doesn’t balance with the price. If you are chasing after the “bang for the buck” then you should look no more, you simply need to check out its price on Amazon, and I’m sure you’d make your decision. Petspy does not have a lot of reviews like it’s competitors I guess it came to the party late. Nevertheless, it managed to get its share of positive ratings. Most Amazon qualified customers gave it its share or ratings, it currently has 3.6 stars, and it’s not that bad. The price is also reasonable i simply can’t complain. Its shaped in a stylish manner that won’t annoy you when using in public. The shape also makes it much much more portable, so you can comfortably hold it on your palm or simply fit it in your pocket. This collar can literally fit all sizes of dogs, its a grow with it, die with it situation. You can fit it on dogs starting at 10lb and Diameter=2.5 going up. The remote transmitter will work at a range of 1100 yards, that’s definitely something to look out for. 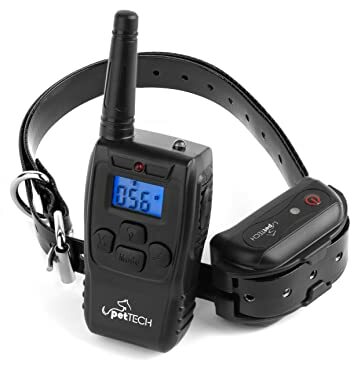 Basically, this dog collar has all types of stimulators, namely vibration, sound, and static. Petspy offers one year warranty for this collar, and buying it is risk-free because they have a customer care line that works 24/7 so anytime you can contact them and inform them if any problems arose. 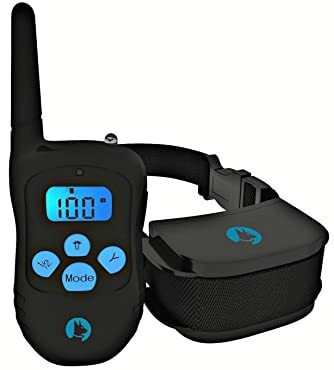 What’s awesome about Petspy dog collar is they don’t leave you hanging; instead you will get a complete guide which will walk you thru the whole training process. You’d pay extra bucks to get it from “some” place so if you want this feature you can buy this now. This collar is also waterproof, and it also has something special which is a movement sensor. This collar also has all long lasting battery which is also assisted with power saving mode. This device has eight adjustable levels for all stimulators. You can get this when you want value for your money because the price and its features are at par, the other thing is it has extra features you’d not find on “some” random dog collars. 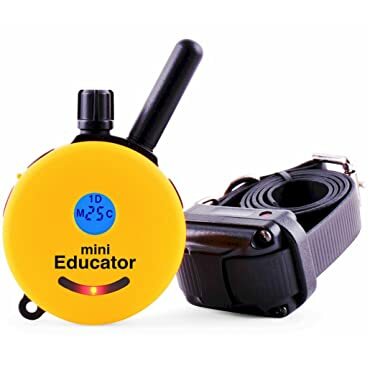 Educator E-collar has an entry level kind of style. The remote transmitter is designed in a stylish, sporty look, that won’t annoy you when using in public. This dog collar surely came late to the party, but it was worth the wait. It has a boatload of features which we are going to explain. 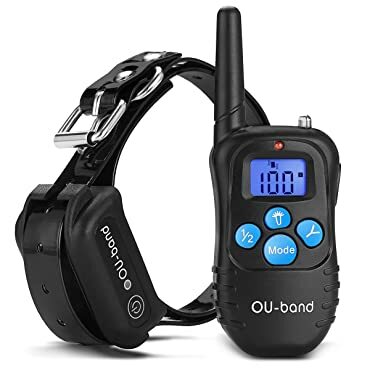 This collar has over 600 reviews on Amazon, and it managed to amass an unbelievable rating of 4.4, you surely won’t regret buying this dog collar. Their customer service is also unbeatable compared to its competitors. If you have any problems, you call them, and they will reply in fast and execute the problem in a jiff. You will have to invest more bucks to get this one, but i promise that the investment will be worth it big time. This dog collar doesn’t release static energy, but instead, it stimulates your dog with a taping like sensation. It doesn’t mean that it’s not effective, but its so effective in a way that will surprise you infect the vibration or tapping sensation will be more intense. It also has maximum safety features that you can rely on. Basically, the stimulants it has are namely sound, vibration and tapping sensation. This collar comes equipped with two powerful lithium ion batteries which you only charge for two hours. 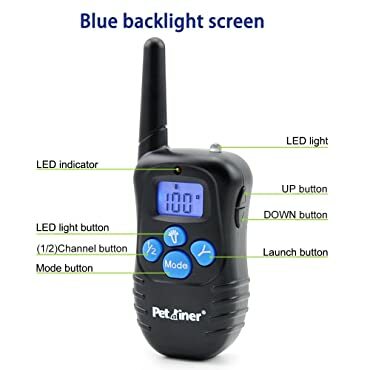 If you have two dogs, you can simply head over to Amazon and select an option for a remote that controls two collar receivers. The stimulation levels number up from 1 to 100. It also has additional stimulants boosters which range from 1 to 60. The wave range supported by the remote transmitter is 1/2 mile. If you’re looking for something that’s premium, then Educator E-collar won’t disappoint. Ou-Band received quite a number positive reviews, which obviously means the buyers liked it. For the record it got a 4.0-star rating from Amazon, you can fully rely on such a collar since it has an excellent rating. They offer an incredible lifetime guarantee which means you ask for a refund or get a replacement. Their customer services are so great in a way that they will quickly respond and take necessary measures if you contact them with any problem. Another good thing they offer is coaching, you won’t be alone when training the dog but instead, you can contact a professional dog coach through email, and he would walk you thru the process. This dog collar is used by both professionals and newbies, and you’d be able to teach the dog to teach the dog to sit, lie, run, and other tricks. The dog would actually learn faster in that way. This dog collar has all types of stimulants, and you will definitely find one which it obeys. The levels of the stimulants range from 1 to 100. Ou-Band dog collar also has rechargeable lithium-ion batteries that last longer. The collar receiver is water resistant, so you can use it when it’s rainy. The dog collar fits all dogs, be it, small to big, even that pitbull of yours fits in without being choked. The wave range for the collar and remote is 330 yard, that’s enough to train it in a park. It also has the LCD screen to display necessary info like the level of stimulation it’s on. The LCD also has a backlight ti assist at night. You can definitely buy it if you think it fits your style. Bark solution has been in the market for quite some time now. It managed to get over 900 reviews from Amazon. It also got a positive rating of 4.2 stars from Amazon. This one comes equipped with four types of stimulants namely light, sound, vibration and static. The collar fits all dogs, and it’s universal. For the record here’s how the numbers look, 15-100 lbs and collar sizes 7-26 inches, these definitely no excuse for not buying one for your Chihuahua. What this collar basically does is, it stops the dog from bucking, therefore, giving you peace. I believe this collar can be used to train the dog indoors or even outdoors, as in you can train it more tricks instead of one. The wave range for this collar is 330 yards. The collar is durable since it’s made from nylon. The size in length for this collar is 14 to 24 inches long. Bark solution collars are easy to use because the buttons are crafted in a way which you will easily remember. You would be able to press the button without looking at it in a matter of hours only. Bark solution collars are designed in a way which will give your dog maximum safety because they are equipped with Auto-Protect Mode. The range of stimulation levels for these collars are 1 to 100, mostly five works perfectly for small dogs, but for big stubborn dogs, you’d have to use 70 to 100. In my own view i think Bark Solution isn’t only used to stop a dog from barking only, nut it can be taught several tricks with it. Checking it on Amazon will definitely be worth your time and the last time i checked it was on discount. There are many things to consider when buying a dog collar, so after reading the dog training collar reviews, please read this buyers guide. It’s impossible to write everything in one sentence, so It’s broken down to small digestible titles that won’t overwhelm you. The money that you’re going to invest on a dog collar determines whether the dog is going to have the maximum safety or not. Many low-quality collars are sugar coated by beautiful, attractive covering yet having unspeakable price tags. Now that’s where PetLoverGuy dives in and shows you the best dog training collar that’s safe and priced reasonably. Picking a dog training collar is hard and overwhelming because there are loads and loads of dog collars all screaming “Buy Me,” and yet they’d be of low quality. PetLoverGuy cuts to the chase by doing an in-depth research and coming up with six best collars that you won’t regret. Keep glued to the article because every single bit you need to know is written and explained thoroughly. Well, the size of the dog matters because the collars are different. They are all made in different sizes, so when buying either on Amazon or anywhere you have to ensure what size of dog it is made for. It’s either you’ll find a universal one or one that fits big dogs or one for small dogs. The collars don’t have age or size restrictions, and it is possible to find a dog training collar for small dogs. This depends on the number of dogs you have. It’s hard to control 2 or 3 different remotes at once; you may get puzzled and hurt the wrong dog. Now that’s where the multi-dog remote controller comes into play. It’s easy to use; you won’t get puzzled, you won’t hold a bunch of different remotes. Instead, you’ll have all the functions on one remote. There are mainly two types of batteries you’ll find namely rechargeable and non-rechargeable. I don’t have any problems with non-rechargeable batteries since they can last for a couple of days, the only problem I have is on rechargeable batteries. When buying a dog collar make sure the batteries are stable. When you regularly train your dog, it’s always important to have a pair of batteries that can last for a couple of hours. This is important, especially in rainy countries. Picking the best waterproof dog training collar is an investment that is worth thriving for, and you’ll be guaranteed that it won’t be damaged by water. This depends on the training field because so far the highest we have come across is as high as 1 mile, that’s ridiculously high because that means you can control a dog when it’s a mile away. As for low level or home trainers getting one that works on a maximum of 300 yards or ½ a mile is good. There are three types that are popular right now namely vibration, tapping and shocking. Many dog collars are specially made for one type of stimulation, but you can find one which has all. There is a new feature that’s obviously found on newly released dog collars that are called “Pavlovian“. What it does is it first gives warning to the dog in the form of sound before it is stimulated, when the dog quickly responds you’d then release the button, so that will be kind of fair instead of a surprise. Hope these basics were helpful to buy a new dog training collar. Dog training collars are 100% legal and safe for any dog out there. Dog collars actually eliminate the use of the old traditional way of disciplining a dog, those ways may cause stress and anger, and the dog may develop a bad behavior in such a piece of training. The training collar is rather 100% safe and reliable, the dog will learn faster, and it will pick the commands at a faster rate. It won’t develop any bad behaviors, but instead, you will remain close. So there you have it! So far we have explored all that needs to be known about dog training collars, and I’m pretty sure you’re well-equipped to get yours now. I hope the information in this buying guide comes in when it comes to taking the plunge into the world of dog’s gear.